To acquire information on suspect clubroot lands in Strathcona County, please contact 780-417-7100 ($26.25 fee per call, maximum of 25 parcel inquiries per call). As clubroot is becoming more prevalent in Strathcona County, making the choice to use sustainable agricultural practices such as extending crop rotations, cleaning your equipment and using clubroot resistant canola varieties can help protect your cropland now and in the future. Infested fields experience economic losses through the reduction of crop yields and seed quality. The disease is long-lived and can spread easily by infested soil carried primarily by field equipment. Prevention and management are the best tools as there are not many control options available once a field has been infected with clubroot. 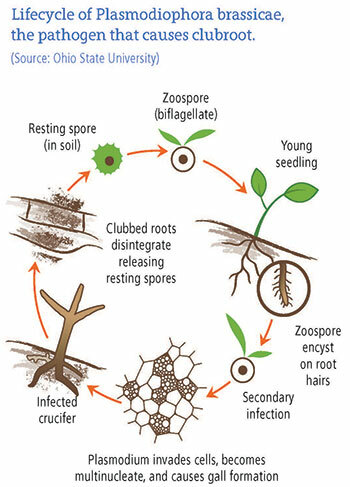 Clubroot spores move readily with any soil movement. The primary mode of transportation is field-to-field by contaminated equipment. It can also move through wind, water, soil erosion and animals. Dust or earth tags from infested fields can contaminate seeds, hay and straw. Galls appear on the roots of the infected plants, ranging from tiny nodules to large club-shaped growths that may involve most of the root system. At first the galls are firm and white but become soft and greyish-brown as they mature and decay. Severely infected roots cannot absorb enough water and nutrients to properly nourish stems and leaves which results in stunting and wilting. At the end of the season, the galls break down into the soil releasing millions of new spores and the cycle continues. Symptoms of clubroot vary throughout the growing season. Early infection at the seedling stage can result in wilting, stunting and yellowing of plants in the late rosette to early podding stage. Infection that occurs at a later crop development will cause plants to ripen prematurely and the seeds will shrivel. Research has shown that fields with 100% infestation will have a yield reduction of 50%. A field with a lower rate (10 - 20%) of infection will have a lower rate of loss (5 - 10%). The plants may not appear to be affected by the disease; however, if the disease is not managed and allowed to spread, the infection rate will increase rapidly. Within only a few canola seasons the spores will multiply quickly and the disease will become much more difficult to control. The loss to crop production will become very evident. 1. What is the Provincial Government doing about clubroot? Permanent link to What is the Provincial Government doing about clubroot? Clubroot was declared a pest under the Alberta Agricultural Pest Act in 2007. This Act gives municipalities the responsibility to enforce pest control measures within their jurisdiction. Pest inspectors are appointed by the municipality and may enter private land at a reasonable hour, without permission, to inspect for clubroot and other pests as well as collect clubroot samples. Owners and occupants of the land are responsible to take measures to prevent and control clubroot on their land. The Alberta Clubroot Management Plan, provided by Alberta Agriculture and Rural Development, outlines management and sanitation measures to prevent the spread of clubroot from infested areas. These control measures outlined are accepted throughout the province as a standard level to prevent the spread and establishment of the disease. 2. What is Strathcona County doing about Clubroot? Permanent link to What is Strathcona County doing about Clubroot? A proactive inspection program allows Strathcona County to provide timely education and promotion of best management practices to minimize the spread of the disease. All canola fields and fields found with volunteer canola will be inspected for clubroot. Fields known to have clubroot from previous years will be inspected and monitored to ensure that the disease is being controlled. Inspections will take place from the beginning of July to the end of September. Strathcona County's policy is to identify the disease in croplands as to limit the spread and establishment of clubroot within the boundaries of the County. Our inspection program has been successful in monitoring the disease and working with landowners to develop management plans following recommendations provided under the Alberta Clubroot Management Plan. A notice may be issued under the Alberta Agricultural Pest Act depending on the level of severity and control measures being taken to prevent the spread and establishment of the disease. use clubroot resistant varieties in areas known to have clubroot. Resistant varieties should be rotated to prevent the breakdown of resistant traits. use long crop rotations (three or more years) between canola crops to reduce disease severity and reduce other crop diseases. Fields with confirmed clubroot should use resistant varieties and follow crop rotation practices of one canola crop every four years. control volunteer canola and weeds to prevent spore production on host plants. avoid common untreated seed as earth tags may carry clubroot spores. Clubroot resistant canola varieties are available through seed companies. Resistant varieties are recommended for use in fields that are infected with clubroot or are in areas that are known to have the disease. Breakdown of resistant traits can occur as the pathogen adapts to the modified hosts. Used along with an extended crop rotation and equipment sanitation, resistant varieties are a useful tool to manage and prevent the development of clubroot. It is also recommended by Alberta Agriculture and Rural Development to alternate the source of resistant varieties when possible to help slow the breakdown of the resistant traits. Transporting contaminated soil on field equipment poses the highest risk to introducing clubroot into a field. Diligent cleaning and sanitation practices can reduce the risk of introducing clubroot to a clean field or moving spores from an infested field. Knock or scrape off soil and plant debris. Sweep off any loose soil. Pressure washing, steaming or compressed air can be used to remove residual soil and debris. Apply a disinfectant (1 – 2% active ingredient bleach solution) to the clean surface. Compressed air can be used for electronics as they may not be compatible with water and disinfectants. Confirm with equipment manufacturers if the cleaning methods are safe for the equipment. Landowners can prevent the spread of clubroot to their land by ensuring that oil and gas companies and contractors are taking measures to minimize soil transfer in areas where clubroot is known or is suspected. Measures may include developing protocols for field staff and contractors, cleaning equipment and avoiding traffic during wet conditions. Landowners have the right to negotiate and include clauses in lease agreements, some surface details of wells, pipelines and facilities. Location of these developments, access roads, compensation, fencing, topsoil, drainage, weeds, clubroot management, trees, water well testing and reclamation are a few examples that may be considered. Oil and gas companies are encouraged to prepare and follow clubroot protocols for staff and contractors as per the management objectives outlined by the Canadian Association of Petroleum Producers in the published Best Management Practices. Custom equipment operators, pesticide/fertilizer retailers, consultants and other representatives involved with the agricultural production that are operating in areas that are known or suspect of clubroot are encouraged to develop protocols to clean and sanitize equipment. Equipment should be cleaned thoroughly prior to being used in any field. Limiting the accessibility and traffic to your property can help prevent recreational users from tracking clubroot and other diseases to your land. Fences, gates and signage can be an effective method in deterring recreational activities from coming onto your property. When participating in recreational activities yourself, stay on your own land or discuss a strategy with the landowners of neighbouring properties prior to entering their land. Be respectful of their land, fencing and signage.